It’s too good of a recipe to share with you again this summer. Enjoy! It actually got hot here, like seriously HOT! It hit over 100 a few days last week, which it has not done in a few years. That is a big deal around here in the Pacific Northwest. There were heat warnings, cooling centers, free water, and the lot. Did I mention it got to 87 degrees in the kitchen at school? Not cool man, not cool at all! I figure they didn’t compensate the AC for the dozen ovens, and deck ovens on 400 degrees, but who knows. It was hot. So I made pasta, early in the morning for a few meals last week. I grilled chicken and pork chops, early in the morning, just to have some lunches and dinners made ahead when it got too hot to be in the kitchen. Plus Brian started an internship at an amazing web design studio last week. So I have to make sure the fridge is stocked with tons of food because he goes from work to school and is gone from 7am to 10 pm most days now. I will stay sane, I promise. For this sane pasta dish, it being summer and all, I had zucchini and tomatoes right from the vine. What a better way to make an easy summer meal than putting your fresh veggies into a good pasta with simple olive oil goodness? That is what I did! 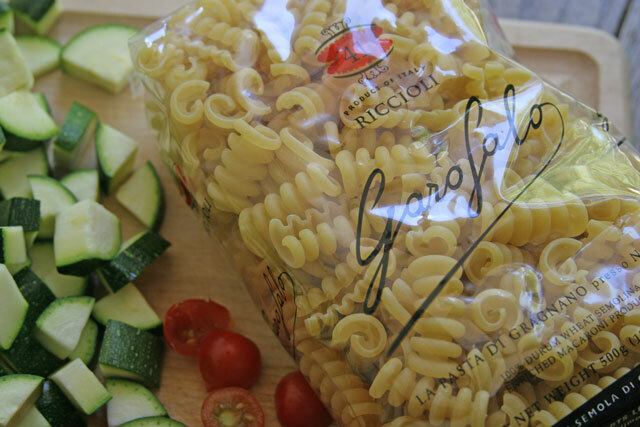 You could easily add other summer veggies, what you have on hand, or in the garden, and it would be a lovely pasta! 1. Start boiling the water for the pasta. Chop the veggies. Then place 1 tbsp of olive oil in a large pan, heat over medium heat. 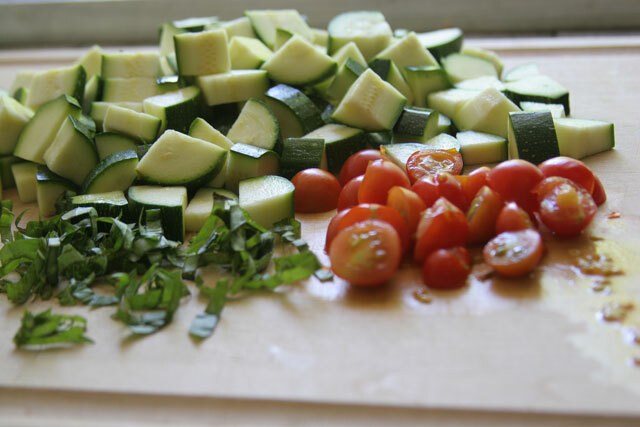 Once the pan is hot, add the zucchini and tomato, sprinkle with salt and pepper, about 1/2 tsp each, cook for 10 minutes. Add the garlic after 8 minutes or so. Cook until fragrant or for a few minutes, careful not to burnt he garlic. 2. Cook the pasta as directed on the package. Ladle one cup of pasta water and reserve before you drain the pasta. Drain. Place pasta back in the pot. Add 1/2 cup of pasta water. Add the zucchini mix to the pasta, mix well. Add the rest of the olive oil, and crushed red pepper flakes. Mix well, taste. Need more salt? Add it now. I added 1/2 tsp of salt, and more black pepper. Place in a family style bowl, and top with the chiffonade basil. Serve with crusty yummy bread, and a beautiful summer salad for more veggies! Super simple yet flavorful way to a summer salad. 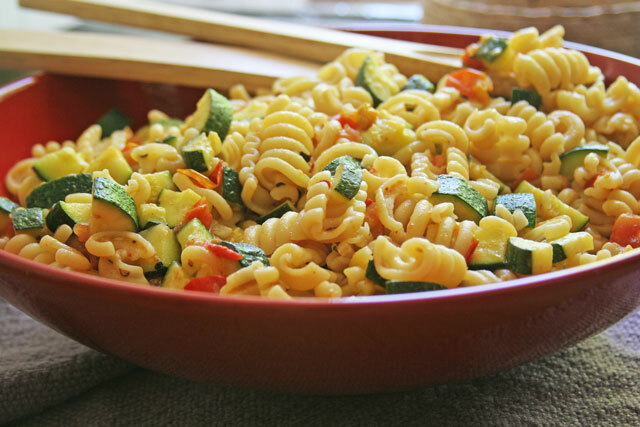 I love the idea of adding zucchini to a pasta salad…this looks perfect for summer! That is a nice, summery pasta dish with the tomatoes, basil, and cherry tomatoes. My family always likes a kick of red pepper flakes in their pasta, too. And you are right about that brand of pasta, it’s superior. I buy it at Costco for the people in my family who prefer white pasta (the young adults). I’m glad I stopped by your blog, your love of cooking shines through! You are so sweet! Thank you for your kind words, it means a lot to me. What a gorgeous dish! Would love that for dinner tonight. Thank you! And thanks also for stopping by. You got me drooling with the word “spicy”. That looks delish! What a great looking pasta dish! I love the chili flakes and like that brand of pasta too – some of my Italian friends recommended it to me and I’m a fan! That’s awesome! It so simple, and tasty:). I love that you’ve added heat! It always takes pasta up to the next level, in my opinion. I totally agree. My mom always puts crushed red peppers in her pasta no matter what! It was my pepper inspiration for this.